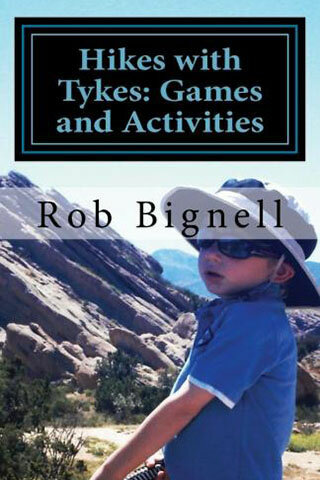 Rob Bignell, the author of Hikes with Tykes: Games and Activities, is an author, hiker, and a dad. Somehow, he found the time to put the three skills together and develop the Hikes with Tykes series of books. "Games and Activities" is the second book of the series. Through the years, we have hiked with many companions - young and old. While leading groups, when we notice that a hiker is having trouble maintaining the group speed, we begin to find and fix the problem. Are they developing blisters? Are they out of shape? Or are they just having a bad day? Regardless of the cause, the effect means the group is not going to have fun until the problem is solved. If the issue is health related - perhaps it is just time to turn around, but for almost all other problems, there is another answer. Let's face it, hiking takes more effort than sitting on the couch. If the hiker is not enjoying nature and the effort it takes to view it, then, that hike might very well be their last. To take the hikers mind off of the effort required to move up a steep hill, we look for diversions. When we are able to get the hiker thinking about something other than the the comforts of home, the hill no longer seems quite as difficult. This is the same theory Rob Bignell teaches in Hikes with Tykes, how to use games and activities to keep hiking with children more fun and less work for all. Bignell (the author) does a good job selling his main idea - it's good to get kids outdoors. Included in the book is a section on "How to Hike with Kids." The first book in the series covers the material in more depth, but the fundamentals are sound. He covers clothing and gear for the child and adult hikers, navigation information, food and drink, first aid, the dog, and rules of the trail. As I read a section called Attitude Adjustment I was delightfully surprised that the adjustment was for the adult to adjust to the child's schedule. The suggested first aid kit is quite comprehensive. We are big dog walkers. The book suggests that the family dog join you on the trail, but not on a leash. Few public lands allow dogs to be off their leashes. Walking with a dog on a leash and a child, might be a bit much. The important rules to teach respect and minimum impact are emphasized. Preparing for a hike is as important as the hike itself. The book even covers such crazy things as building a backpack out of duct tape! Amy said there was an episode on "Myth Busters" that built lots of things out of the amazing tape, so why not a backpack. One key ingredient of any hike is good food. We only eat certain foods while hiking, and love them at our rest stops but never eat them any other time. Children would soon learn that when they hike they would get that yummy treat and even better if it is homemade with the help of a chef-ette. To avoid the 'when are we going to be there' whines, a special section is included on games and activities for the drive time. Each game includes suggested ages and required materials. The second part of the book gives ideas for games and activities to use during the hike. One chapter is dedicated to Nature-Oriented fun and the other to Kid Tested, more traditional games. Many of the Kid-Tested happenings had a nature oriented twist. Good simple ideas such as - playing Hacky Sack with a pine cone, abound. Finally when the hike is over it is time for Creating Memories. The final section gives good ways to remember the hike. The suggestions range from debriefing the child (you never know what they might say if you ask) to signing and dating a map. I love maps and loved the idea. The book also includes a great index. When I could not find what I had read, I just looked it up in the index, what a novel idea, but is often times over looked. We did not purchase this book. The author sent us a copy and asked if we would review it. We responded, 'Only if we like it!' We did. The book does a good job compiling and creating ideas of how to make a hike a special adventure for children. It was even a fun read for us. Some of the games would also be fun for adults - they would definitely help take your mind off a grueling climb.